In his long and varied career in animation, Shin’ichi Suzuki has worked behind the scenes on many anime classics. He was a key animator on Osamu Tezuka’s unfinished masterpiece Legend of the Forest (森の伝説, 1987), Taku Sugiyama’s classic science fiction anime Phoenix 2772 (火の鳥2772 愛のコスモゾーン, 1980), and Katsuhiro Ōtomo’s ground-breaking Akira (1988). 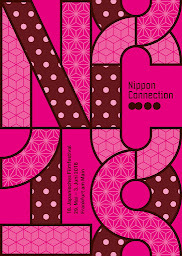 In addition to key animation and inbetweening, he has worked as a character designer and animation director. Anime projects involve a lot of artists and it is not always easy for us as spectators to recognize the contributions of individuals to the process. 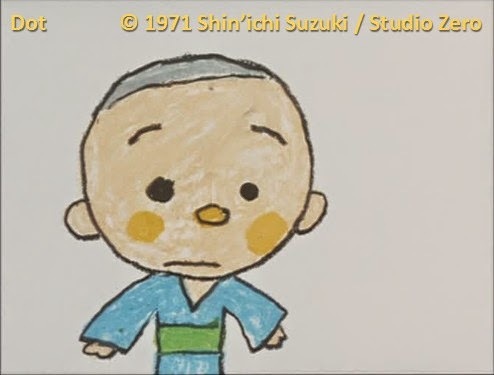 Fortunately in the case of Suzuki, he made some independent works in the 1960s and 70s that give us some insight into his talent as an animator and a comic artist. 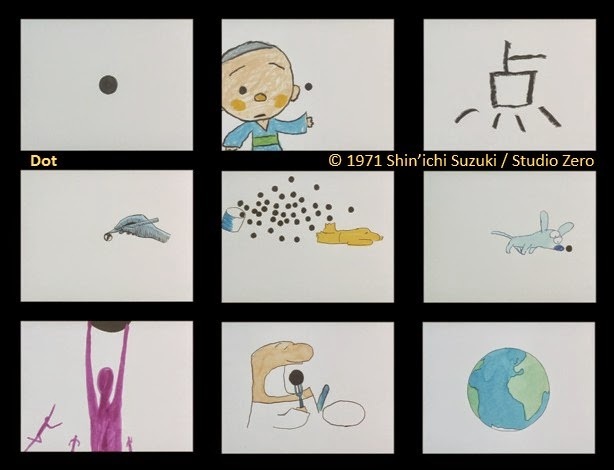 His short film Dot (点, 1971) played at the 8th and last of the Animation Festivals held at Sōgetsu Hall alongside films by fellow innovators such as Goro Sugimoto and Keiichi Tanaami. 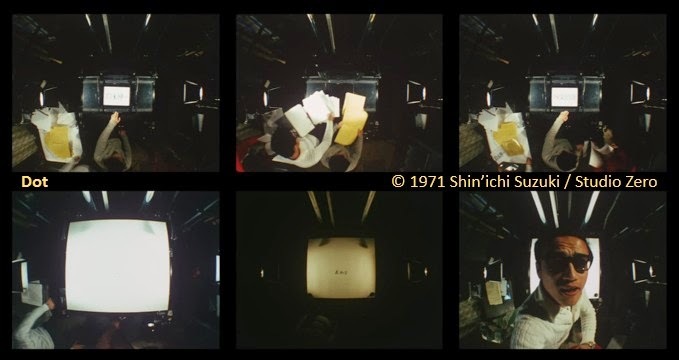 Dot (点/Ten, 1971), also known as Dots or Spots, opens and closes with self-reflexivity – a look behind-the-scenes at the methods behind the magic of animation. 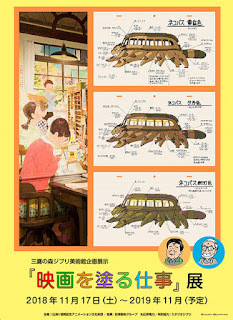 The overhead camera used to shoot the frame-by-frame hand drawn animation has been placed higher than usual in order to capture not only the page but the animation desk, the animator and all of his assistants. By increasing the playback speed, the action has been sped up to show the animation team at work. 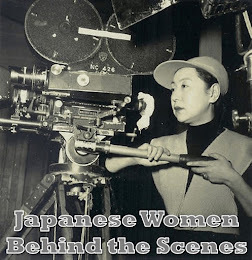 Upon closer inspection of the sheets of paper being put on the animation table to be filmed, one can make out the names of Suzuki and his crew in Japanese. Some of the names where difficult to make out because the print was too small, but the ones that I am sure of are: 鈴木 伸一 (Suzuki), 坂東昭雄 (Akio Bandō, the cameraman), 矢沢祐二 (Yūji Yazawa), 佐藤 茂夫 (Shigeo Satō), 西出栄子 (Eiko Nishide, editor), 藤田紘一 (Kōichi Fujita), 明田川 進 (Susumu Aketagawa, sound), plus four others. The soundtrack squeals over the opening credits like an old recording playing back at an increased speed. 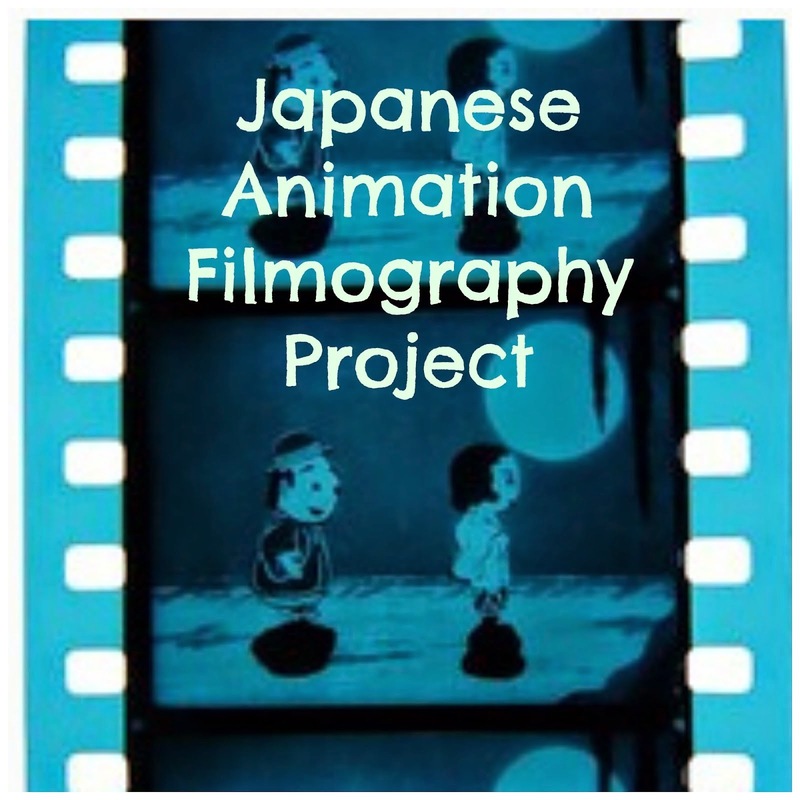 A larger white piece of paper is placed on the animation table and the camera zooms in to reveal a small black dot. This is followed by a montage of dots of varying sizes and colours, then a series of vignettes showing dots in various contexts. A boy in kimono has dots for eyes, one of which repeatedly tries to escape his face but the box keeps placing it back. A montage of the Chinese character for dot (点) in different sizes and colours. A man spills a container of dots and then tries to vacuum them up, but one of the dots resists. A dog barks at a dot, which transforms into a set of jaws that attacks the dog. A man tries to pummel a dot but is sucked into the earth. A man walking gets a dot stuck in his geta (Japanese clogs) and turns himself into a pretzel trying to free his geta. A team of men play with the dot as if it’s a ball. A man lights the dot as if it is a bomb, but he himself explodes. A bird tries to carry off the dot, but it turns into a pole. A man eats a dot and it goes through his body as if the stomach is a pachinko machine. The dot turns into the planet earth, and a rocket blasts out of it to an explosion of American flags. The dot turns into a noose onto which a man is hung to the sound of a toilet flushing. The soundtrack is a mixture of funky music, pinging noises, sound effects to complement onscreen actions, and found recordings (such as the sound of a rocket launch). 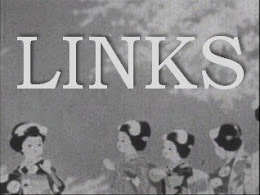 The film demonstrates Suzuki’s skill as an animator, his love of visual gags, and his sense of poetic irony. It’s a small gem of a film with bonus footage during the opening and closing credits that act as a documentary of how low budget animated films were made in the early 1970s. Born in Nagasaki, Suzuki began his career as a manga-ka when he was a high school student, submitting his works to magazines such as Manga Shōnen. In 1956, he joined Otogi Pro under the mentorship of anime pioneer Ryuichi Yokoyama where he worked on the series Instant History (later renamed Otogi Manga Calendar, 1961-64). 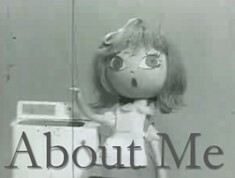 Together with his fellow manga-ka Fujio Fujiko, Shōtarō Ishinomori, Jirō Tsunoda, Fujio Akatsuka, and others, he established the short-lived Studio Zero (スタジオ・ゼロ1963-1971). He has been involved in the production of a variety of animation from indie to mainstream. 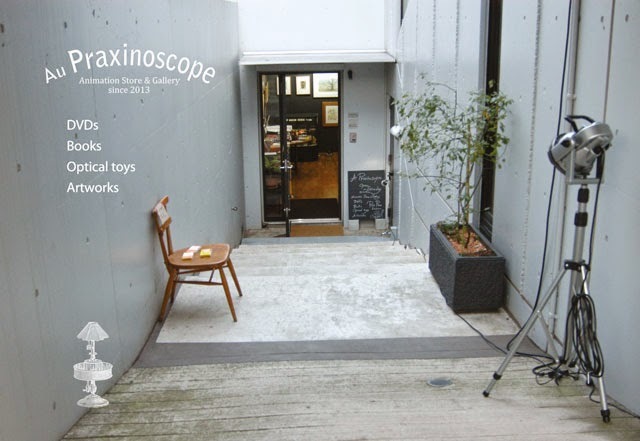 Suzuki is one of the founding members of the Suginami Animation Museum and since 2005 has been its director.